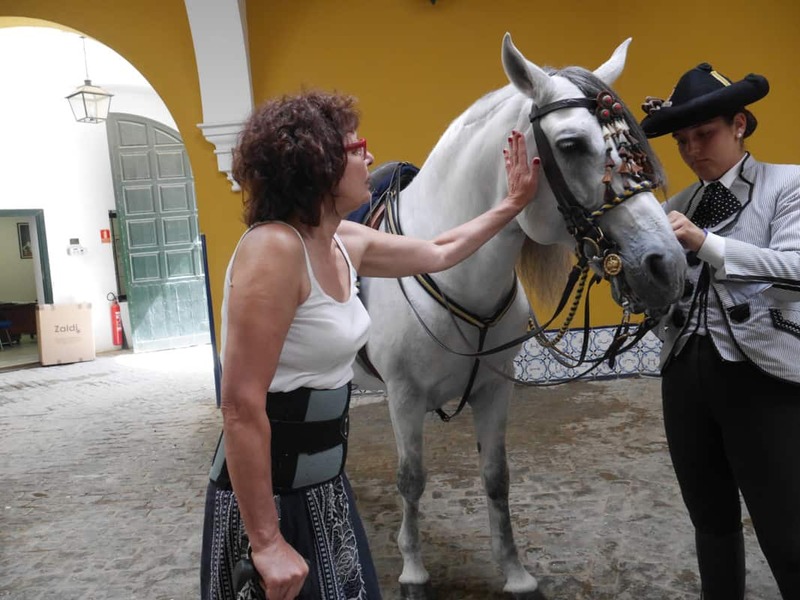 I’ve always loved researching roots of different cultures because I believe we are the sum of all that has gone before, so before I begin writing about my flamenco experiences with Tatiana Ruiz or the visit to the Royal Andalusian School of Equestrian Art, I need to explain briefly about Jerez de la Frontera and the unique Andalusian cultural heritage dating back thousands of years. It is truly a potpourri or popurri right back to the Tartessians who traded in gold artefacts and gathered tin from the rivers running into the Bay of Cadiz, through the Phoenicians who settled here to trade, then the Greeks, Romans, Arabs and Berbers. My ‘Learn Spanish in 15 Minutes’ should have made me realise that ‘de la Frontera’ literally means ‘frontier’. Here was the dividing line between Christian empires to the North and the Caliphate of Cadiz. Jerez is fascinating, proud and unique, with the love of bulls brought by Phoenicians and horses from the Arabs and a sublime mix of architectural styles interspersed with magnificent statues and works of art. Andalusia is a complex mixture of invasions, settlements, influences, including the migration of Jews from North Africa who thrived under a tolerant Caliphate (there is a splendid synagogue here), and of course the North Indian gypsies who brought their dance and rhythms. Andalusia is the product of years of peaceful but also possibly painful and violent assimilations, resulting in a fabulous culture that still carries living traditions. Something similar to our own history, except that our traditions are dying or have become obsolete and we are now perhaps less welcoming of others. Are there lessons to be learned? It is worth mentioning the prevalent ochre walls which is actually very specific to Jerez and the surrounding area. The colour of the paint traditionally came from using local soil which gives the deep-yellow tint. PS The architecture is designed to keep people cool and we are in definite need of fountains, white walls, plazas full of acacia, jacaranda, lime trees and date palms offering shade during this heatwave! Trundling around with a padded Powerchair in 36C heat is most uncomfortable. Please sign up to updates from my website. You can also follow my story via the Twitter hashtag #PowerchairWriter @leblackwood or on my new Facebook page – many photos, blogs and videos can be found there!